As adults, we benefit from learning new languages for multiple reasons. Some of us may pick up a few key phrases before traveling. Others may learn new languages for our jobs. And we all know that speaking a few different languages can increase cultural competence and an ability to build bridges between people of different backgrounds and native origins. But language learning for young children comes with a whole set of benefits, specifically related to cognitive patterns and abilities, which impact kids on a variety of levels. People who are bilingual perform very differently when it comes to both multitasking and focusing attention than their monolingual counterparts. In fact, their brain scans show a greater amount of gray matter than in the brains of people who speak only one language, specifically in the areas which dictate the capacity for executive function. Because bilingual people must learn to switch from language to language depending on their surroundings and their conversational partners, they are exercising their brains in a different way from monolingual people. Kids who are learning a second language must practice this form of “exercise” as well. Children, from infants to teenagers, have been studied and are proven to have a difference in their cognitive abilities depending upon whether they are bilingual or multilingual, or monolingual. When infants hear multiple languages spoken at home or in daycare, they are more likely to have different cognitive patterns from their monolingual peers. And studies have shown that high school students who are multilingual perform better on the ACT and SAT-verbal exams. What’s more, teenagers who have studied another language extensively score even higher than teenagers with less language experience. 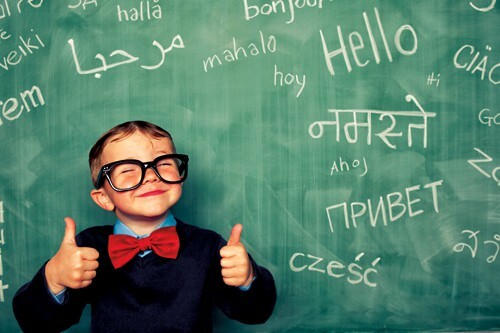 In the past, it was commonly, but mistakenly, assumed that when children learned multiple languages in their very early years, that they would have difficulty becoming proficient in their first language. However, studies have proven this mythology to be incorrect. In fact, children who are learning multiple languages at the same time actually perform better in their native language. Parents are catching on, too. Many parents who speak multiple languages themselves are encouraging their children to learn to speak multiple languages from birth. And foreign language study is becoming more pervasive among young children. Supporting the practice of bilingualism and multilingualism in young children will allow those children to reap benefits both cultural and cognitive.